I've woken up in an Indiana Jones movie. Outside my window a blood-red sun is coming up over a curling jungle which seems to go on forever. A silhouetted flock of birds swoops across the pink dawn sky and monkeys swing from the ornate towers and turrets of what looks like some magnificent ancient palace. Shades of Indiana Jones and the Temple of Doom come to mind, except that this is a temple of indulgence. The Palace of the Lost City at Sun City is the most extravagant, over-the-top, glorious folly on the whole of the African continent. I admit I was prepared to hate it; after all subtle is not a word in that appears in the Sun City repertoire. But now I've been bowled over by it - by the mad, magnificent opulence of it all. I seem to have misplaced my Indiana whip or at this point I'd crack it. If The Palace of the Lost City were a movie it would be an epic, brought to you in glorious, radiant technicolour, with surround-sound and 3D thrown in. It would roar off the screen right at you. Boutique hotels - who needs 'em? Give me grandiose. Paying homage to legends of lost African empires made wealthy by the trade in ivory and gold, the palace reigns supreme over the vast Sun City hotel complex which lies in the isolated near -desert region of Pilanesberg. The realm of the sun is in the middle of nowhere. All that lushness and green, those two championship golf courses, that forest, are the result of expensive irrigation - more evidence of mad magnificence. Built originally as a gambling Mecca, Sun City is now an entertainment extravaganza with hotels, pools, casinos, theatres, ballrooms, and a zany Valley of the Waves with death-defying jungle water slides and an artificial wave beach. Welcome to the kingdom of pleasure. Reeling from an overdose of gold leaf and animal print so early in the morning I make my way down to breakfast. Watched by leopard gargoyles I walk along turreted walkways, past two zebra-striped gold thrones and down a sweeping staircase to a buffet fit for the most wasteful African despot. Exotic Fruit is piled Carmen Miranda high, there are mountains of muffins, acres of cereal, cheeses beyond number and meats of all varieties. A chef is on hand to flip your omelette. Liveried staff bring tea and pour litres of juice from animal-handled glass jugs. In the centre fof the room four near-life-size bronze elephants hold up a fountain. This is the buffet to out 'buff' all others. 'Top this' it seems to say - and few can. Parked outside The Palace are a white Rolls Royce, a black Porsche and a yellow Lamborghini; which sums up the over-the -top indulgence of this place in a nutshell. Sadly I am not climbing into any of them. Instead I yank myself up into an open safari vehicle for the short ride to the Pilanesberg National Park. Each time I've stayed at the Lost City it has been my ambition to sail serenely over the park on an early morning balloon ride, sipping champagne. Wind and weather have always prevented me. On one occasion I even made it as far as the main entrance where the bronze statues of the leopard leaping at the antelope looked disconcertingly real in the murky morning light but I was still grounded. This time the wind gods are on my side. I finally make it aloft and it i worth the long wait. We glide high above the game reserve, a basket of cameras and people suspended under a balloon fired by the gas burners dragon hiss. The animals below don't seen to mind the noise. To be honest there aren't many about, just giraffes in the distance, little brown dots of wallowing hippos and a startled cheetah as we come into land - but it doesn't matter, up here in the clear air the world slows. It's like a morning meditation. We probably see more from the comfort of our 4WD: elegant giraffe, rhinos by the road, various dainty antelopes and hippos wallowing in the water. . A newly-introduced walking with rhinos program brings us amazingly close to a rhino and her baby it is privilege none of will forget in a hurry ( to help stop the ever growing problem of rhino poaching in South Africa go to Rhinos Without Borders). We arrive back at our palace on the hill dusty but happy. A swim in the Grand Pool (capital G, capital P) with its giant sun mosaic, beckons. We walk through the waterfall grotto and out towards the shimmer of blue. Water cascades from giant seashells and guest relax under canopied tribal-style cabanas. I order a cocktail at the poolside bar and it comes adorned with what looks like a whole a chief's head -dress on a stick. Even the drinks here are flamboyant. The Palace of the Lost City is a fabulous flight of fantasy with glittering mosaics, frescoes and hand-painted ceilings; my favourite is the domed ceiling in the lobby intricately painted with African animals. In the Tusk Bar and Lounge there are three huge arches, each made to look like a pair of gigantic elephant tusks, at the Villa del Palazzo Italian restaurant golden lion heads stare out from the backs of chairs. Within the Sun City leisure complex, there are 15 restaurants to choose from but why would you ever leave this luxurious lair? Especially since the food and wine are so good. There are 336 rooms at The Palace including The OTT King Suite, the epitome of despotic grandeur with hand-carved walls, frescoed ceilings and custom-designed African object d'art. All the suites have a sauna and Jacuzzi bath and are frequently occupied by high rolling sheiks and their large retinues. There is even a private casino for throwing around even more cash. Stakes are high. There are also championship golf course on The Lost City Golf Country Club and Golf Course has a clubhouse built for Fred Flintstone - all rock boulders - and a tricky water hazard with 20 live Nile crocodiles on the 13th hole. The other course, The Gary Player Country Club and Golf Course, also has a health spa and gymnasium. 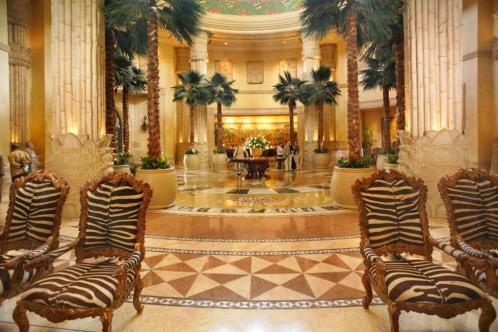 Sheiks, celebrities, royalty all have stayed at Sun City but the most famous resident of all is probably a permanent one. In the Elephant Court at The Palace of the Lost City, stands a life size bronze sculpture of Shawu the Elephant. Shawu was one of South Africa's 'Magnificent Seven' elephants. These were the seven Kruger National Park elephants with the largest tusks and Shawu had the longest tusks of them all. He died of old bullet wounds in the 1980s but his memory lives on at Sun City. I think I've finally found a creature which could truly have done justice to a Palace of the Lost City breakfast buffet. Perfect luggage: Conspicuous consumption is the key, so put a label on it. LV perhaps?